(APN) ATLANTA — Nations around the world are addressing our environmental challenges by taking a novel legal approach, that is, granting personhood status to Mother Earth or to the rivers and lands she comprises. 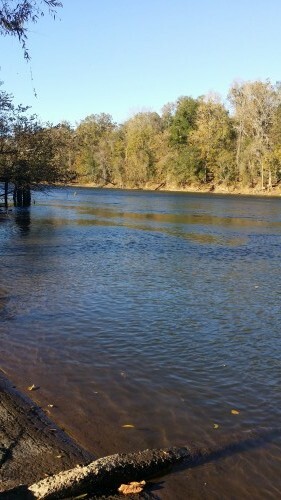 The Savannah River, which runs through Georgia, is the third most toxic river in the United States, according to the U.S. Environmental Protection Agency. Could legal personhood help save the Savannah River? Industries dump over five million pounds of toxic waste into the river every year, with the majority of the pollution occurring between Augusta and Savannah, Georgia. At least four rivers have received legal personhood rights thus far in the world: the Whanganue River in New Zealand, the Ganga and Yamuna Rivers in India, and the Atrato River in Colombia. This legal personhood creates standing for individuals and organizations to sue polluters and save the rivers from more damage. The requirement of “standing,” as it has developed in U.S. Court systems, has been used as a shield to block many environmental advocates from bringing claims to protect the environment. Corporations have acquired many personhood rights in U.S. law. “Corporations are people, my friends,” former U.S. Presidential candidate Mitt Romney previously noted. Why not give polluted rivers personhood rights? Unlike corporations, they are living organisms. The Rights of Nature Laws started in Bolivia at the World People’s Conference on Climate Change and the Rights of Mother Earth, hosted by Bolivian President Evo Morales in Bolivia on April 19 through 22, 2010. Thousands of people from many nations worked on a plan to combat climate change. Led by the wisdom of indigenous people, the conference developed the Law of the Rights of Mother Earth. The Law of the Rights of Mother Earth draws on indigenous concepts of nature as a sacred home on which we depend for our very existence. Indigenous cultures do not view nature as property; they protect nature in ways Western cultures do not. A longer and revised version of the law was passed by the Bolivian Legislature as the Framework Law of Mother Earth and Integral Development for Living on October 15, 2012. The law states that Mother Earth is a living dynamic system made up of communities of all living beings who are interconnected, interdependent, complementary, and sharing a common destiny. The law requires the government to switch from non-renewable to renewable energy, to invest resources in energy efficiency and organic agriculture, and to hold all companies and individuals accountable for environmental contamination. Now environmental lawyers and activists around the world are working on ways to combat climate change. They are developing policies to save Mother Nature from the greed, exploitation, and pollution that stems from being considered property that owners can damage or destroy for short term profit. To continue on the path of depredation of Mother Earth and burning fossil fuels will lead to a warmer planet with disruptive climate changes for future generations. We are at a crossroads where we can either choose the old path of continuing to burn fossil fuels and pollute the environment, or we can choose a new direction and protect the environment and live in harmony with nature. The path we take will determine if humanity survives. The law of nature would give nature legal rights: the rights to life; regeneration; biodiversity; balance and restoration; for clean air, water and soil, so that future generations can survive and thrive on this planet. A new world is possible and the vision and wisdom of indigenous people is leading the way, slowly spreading the Laws of Nature around the world. What started in Bolivia has resulted in at least four rivers and one national park being given personhood in three different countries. In New Zealand, the Whanganue River and the Urewera National Park have been designated as legal persons, with rights much like the legal status of corporations. The indigenous Maori people have fought for over 140 years for the river to be recognized as their ancestor and not as property to be exploited by colonizers. The Whanganue River will be represented by a person appointed by the Maori community and one appointed by the government. The Whanganue River is the first river in the world to receive personhood, but not the last. In India, the Ganga and Yamuna Rivers have been given legal personhood status to help reduce pollution in the two rivers that are considered sacred in the Hindu religion. The Atrato River in Colombia has been granted legal personhood rights by the Constitutional Court in Columbia. Earth Law recognized that nature is an entity with its own rights, rather than treating nature as property for human consumption. Ecuador has incorporated more than seventy environmental laws and policies in its Constitution which includes their criminal code and environmental code; and those rights of nature have been relied upon in over two dozen lawsuits. ROUGH START IN THE U.S.
A federal lawsuit to give legal personhood to the Colorado River in the United States ended when the State of Colorado filed a motion to dismiss claiming the suit did not have standing, and threatening attorney Jason Flores-Williams with sanctions. The question of standing is the first thing a court will ask before they hear the case. If you can’t get over the three-pronged standing hurtle in the U.S., the court will not hear your case. “Standing means direct injury. It is very difficult to show direct injury to the environment, and that you have been directly affected by that injury, and that the Defense is the cause of that injury. If you can’t show those three things, the court will dismiss the lawsuit without looking at the substance or merits of it,” Flores-Williams tells Atlanta Progressive News. “Standing is the way that corporate America has completed undermined the courts’ ability to consider environmental lawsuits. Standing is like a big gate blocking the way forward,” Flores-Williams said. But, if other countries are able to get rivers and even parks declared as legal persons, why can’t the United States do the same? “Other countries have different traditions, different political institutions, and environmental concerns that aren’t under the control of corporate America. In the U.S., corporations whose only motive is profit have personhood. Nature, which we completely depend on for our future, does not have personhood; and therefore, no rights,” Flores-Williams tells APN.